Mark J. Albrecht, cohort ’73, was the inaugural recipient of the Alumni Leadership Award. 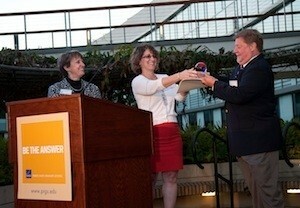 The award was presented on Friday, June 22, 2012, at the Celebratory Dinner during Commencement Weekend. Mark has served and led with distinction in both the public and private sectors. A leading figure in the American space program, he has been the principal advisor on space to President George H.W. Bush as Executive Secretary of the National Space Council. Mark has also been a senior aerospace executive as President of Lockheed Martin’s International Launch Services company. Currently, Mark is the Chairman of the Board of USSpace, LLC. Throughout his thirty-four year career, he has made significant contributions to the well-being of the national and global community. As the President’s principal assistant on military, civil and commercial space policy matters Mark helped to ensure that space cooperation played an important role in easing the exit from the Cold War in the early 1990s. Mark has demonstrated both discipline and a passion for his work while also striving to make a difference in his career. When scientists, policy makers, and space enthusiasts think of one of the strongest advocates of the U.S. space program, they think of Mark Albrecht. Mark J. Albrecht, Ph.D., has been a leading figure in the American space program for over twenty years. He has been the principal advisor on space to President George H.W. Bush as Executive Secretary of the National Space Council. Mark was national security advisor to US Senator Pete Wilson from California. He has been a senior aerospace executive as President of Lockheed Martin’s International Launch Services company. Mark has served on numerous panels and boards of advisors to the United States Air Force and NASA. He has served as a member of several private boards of directors and currently is the Chairman of the Board of USSpace, LLC a company offering innovative approaches to meet US government requirements through privately financed acquisition of rapid response on-orbit capabilities. Mark has written and spoken extensively on space matters. He is a graduate of UCLA with Phi Beta Kappa honors and received his Ph.D. in 1978 from the RAND Graduate Institute, now the Pardee RAND Graduate School. In 2011, Mark released his book, Falling Back to Earth: A First Hand Account of the Great Space Race and the End of the Cold War. The Pardee RAND Graduate School develops individuals with passion and discipline. It takes passion to change the world. It takes disciplined analysis and hard work to ensure that change makes the world a better place. The Pardee RAND Graduate School Alumni Leadership Award recognizes prominent alumni who exemplify both of these characteristics, as well as leadership and public service. The promotion of the prestige of PRGS and/or its graduates through the publication, communication, or broad dissemination of original policy research and recommendations. Awardees' contributions may occur in a single year or over a span of years. The PRGS Alumni Leadership Award will be bestowed biennially.